4am is around the time the big clean up starts. In Las Vegas it’s also the time I rise. The Strip goes into twilight mode as night time revelers gradually de-materialise leaving space for jet-lagged Irish and the cleaners. The cleaners are meticulous, obsessive and thorough to the core. They use industrial vacuums, blow torches and power hoses to scrub the sidewalks in Sin City. Not a spot remains. All sins are forever washed away. It’s the nightly administration of absolution, the relentless search for redemption on the streets of Las Vegas. Our breakfast meeting with Jan Zandboer of Select Group Marketing commences with the sad reflection that our dear friend Moira Hearn (RIP) is no longer with us. Only a year ago we met with Moira and hatched our plans for 2012. She explained to us then, excitedly, that Jan was joining the company and shared her hopes that, over time, he would assume leadership of SGM and take it into the future. Shockingly, all of this transpired much sooner than we expected. Jan is now bravely leading SGM, fully committed to the continuation of a proud legacy in providing outsourced sales, marketing and PR services for CVBs, hotels and DMCs in the Canadian source market. We were immensely impressed with the soon-to-be-launched SGM website www.sgm-canada.com and look forward to continuing our 20 years relationship with Canada through Jan and team. Back on the show floor business was bustling and brisk. Trade show exhibitors are always plotting and planning weird and wonderful ways to increase traffic to their booth. From tchotchkes and trinkets to munchies and mini-skirts, it’s all been tried before with varying degrees of impact. To date, however, these approaches have tended to be tactical, aimed at little more than snaring a random prospect and securing a business card. At IMEX America, however, we saw some very clever and strategic tradeshow marketing focused on more enduring objectives like brand equity and impact. Ovation’s Huggability Award is a case in point. We market our presence at the show with a 6 week on-line campaign centred on the creation of a short list of 10 award nominees. The overall winner is then announced on the first afternoon of the show with all nominees receiving a certificate and being inducted into our cub club. We get great publicity and booth traffic as a result but, over and above this, our campaign re-enforces key brand attributes – fun, human connectivity, relationships etc. 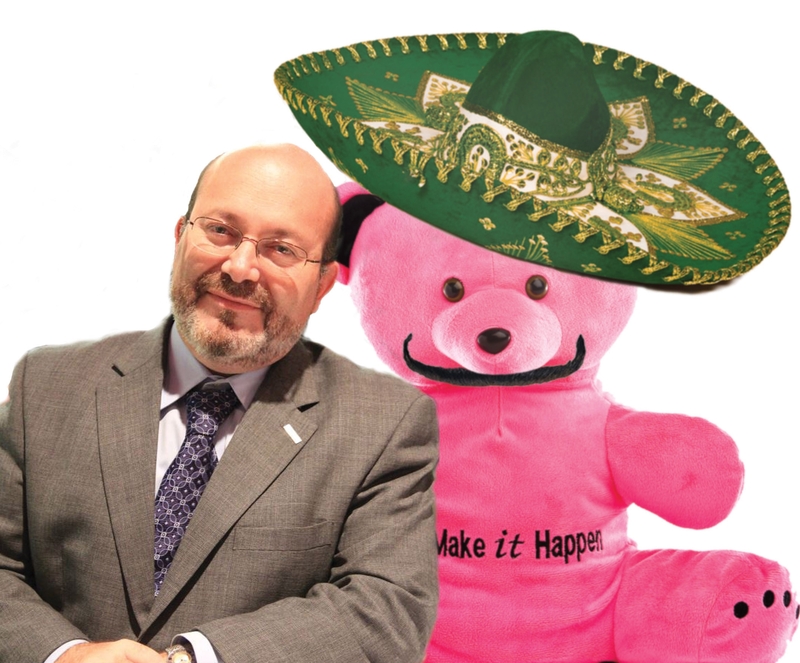 We’re delighted with this year’s winner, the eminently huggable Eduardo Chaillo of the Mexican Tourist Board. We know he’ll follow worthily in the footsteps of the our 2011 recipient, the ebullient Samme Allen of The Barbican, and take his soon-to-be-named bear with him everywhere. 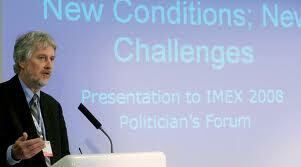 IMEX America also offers a plethora of outstanding educational opportunities from daily keynotes to panel discussions. These take place typically outside of trade show hours so commercial considerations and the need to keep traffic on the show floor are never overlooked. I participated on a panel under the aegis of AIPC moderated by the smooth-tongued silver-bearded Rod Cameron who serves as AIPC’s Executive Director. My fellow panelists were James Rees of Excel London, Annabel Norris of the Sydney Convention and Exhibition Centre and Claire Etches of Destination DC – all in the destination marketing or convention centre space. As lone voice in the wilderness representing the PCO community I felt an ambush coming on! Our discussion ranged over a wide variety of topics including our creative response to the on-going macro and micro realities of these challenging times. James Rees reported an interesting change in the origins of his business with greater percentages now coming from outside of the UK, particularly the US. Excel has reacted to this new trend by producing collateral in “American”, using US terminology and room / facility measurements. Martin Lewis and I (combined ages >110 years) were joined for cocktails and dinner by Aoife Delaney and Eggert Olason (combined ages < 60 years). It was an interesting microcosm of the demographics of our industry with Babyboomers and GenY, parents and their children, blended together like a vinaigrette dressing. Our cocktails at The Bourbon Room in the Venetian were consumed to a backdrop of 80s music which we all mostly ignored – for Martin and me it was “after” our time, for Aoife and Eggert “before”. Conversation flowed easily across the generational divide as we quizzed Eggert about life in Iceland, the movie industry and working with celebrities (Aoife asked all those questions). Dinner took place at The Mirage at B.B.King’s (RIP) where both generations were at home with 60s Motown and sang along to “Stand by Me”. Martin and I, however, were like pigs in muck when the rather amazing band dove into some late 60s blues, cranking out impeccable versions of Hendrix and Stevie Ray Vaughan. When the band took a musical break I noticed that the vinaigrette dressing had separated back into its component parts. Straining to hear above the din, Martin and I talked directly into each others’ ears while our GenY colleagues laughed and joked openly while, simultaneously, they texted, took pictures and viewed each others’ smart phones. They also drank sodas and excused themselves early, leaving Lewis and Gilligan in the indulgence of a post prandial tipple and the after-glow of a successful week in Las Vegas. Thank you for this article. Our small startup AVforPlanners launched at IMEX this year and I was also amazed at both Holland and the Vancouver booths. I was also fortunate enough to be interviewed by the Vancouver web stream and had our own booth mascot AVMan over there riding the bike. Competing with these countries with such booth size and creativity was pretty difficult but I loved that we were able to be there!!! We are looking forward to Frankfurt! By the way I know Jan too and flew back from Las Vegas with him. It’s a small world.